This was my first rock concert! To say the least it was totally awesome and radical! I was a freshman in high school living overseas in Rio de Janeiro, Brazil. 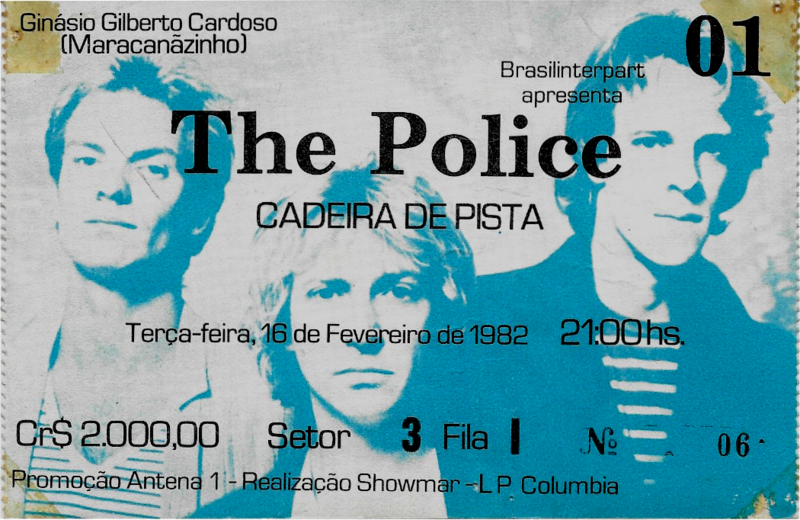 It was an urban paradise with beaches, bikinis, futbol, samba and in February of 1982 The Police played 2 shows during their Ghost in the Machine tour at Maracanãzinho. To say I was stoked is an understatement. I was a huge fan of The Police and had been listening to them heavily since the release of their third album, Zenyatta Mondatta. 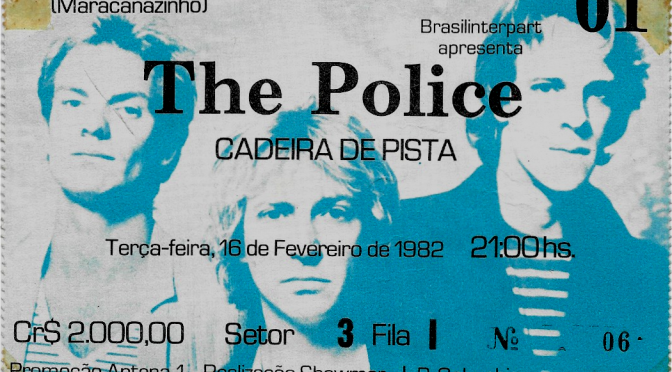 When word broke that Sting, Andy Summers and Stewart Copeland were coming to Rio for 2 shows, a fever pitch hit our community. We had been living in Rio for a little over a year and there had been very few concerts. Rio and Brazil had a bad reputation for fake promoters, scams and other corruption that kept major artists away. Rock in Rio was still a few years off. So when my brother and I scored tickets we were amped! The venue was Maracanãzinho which means little Maracanã, the world’s largest soccer stadium that sits next door. Several of my classmates had scored front row seats and we ended up sneaking from our mezzanine level seats to the floor seating area before the show started. We ended up about 5 rows from the stage with a great view. One of my classmates was fortunate enough to get several front row seats as his father worked for CBS records and had connections. Nonetheless I remember my neighbor, Gabriel and I were glad to be able to get closer to the stage and band! I don’t remember there being an opening band. I was very excited and I was enjoying the energy and vibe of the concert. Once the house lights went down and The Police took the stage part of me realized that this was a special feeling that I may never feel the same way again. 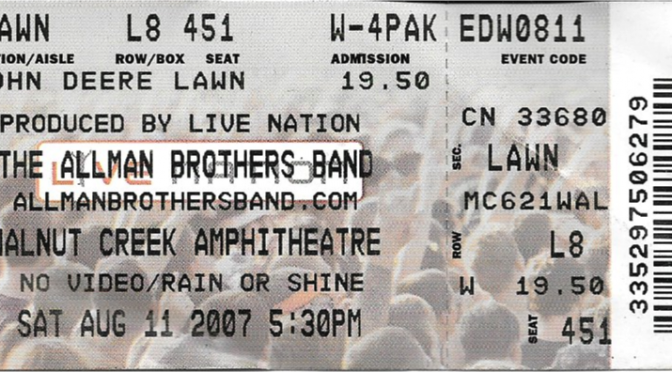 This was and would always be my first concert! Sting, Andy Summers and Stewart Copeland seemed pumped as they hit the stage. Sting was playing one of those 80s minimalist bass guitars. I remember Stewart wearing the 80s athletic “shorts” of the day with tube socks sneakers and cutoff sleeves t-shirt. I was impressed by how high Stewart jumped off the drum riser after the sets. The entire band seemed a bit pumped due to the lively Brazilian crowd and vibe. You don’t play Rio unless you’re ready to impress a town that just wrapped up Carnaval a few weeks before! There was a horn section playing with the band. Several of the songs from Ghost In the Machine had horn arrangements like Hungry for You. It was a interesting mix between the power trio and the 4 man horn section. Several reviews of the tour DVD are critical of the horns and I have to admit that recording equipment in the 1982 was still poor compared to what would be introduced in the next few years with early digital mics. This was a very upbeat opening set with the first several songs. When The Police hit The Bed’s Too Big Without You, they really hit that reggae grove and slowed it down a bit. That song has stuck with me over 30+ years! 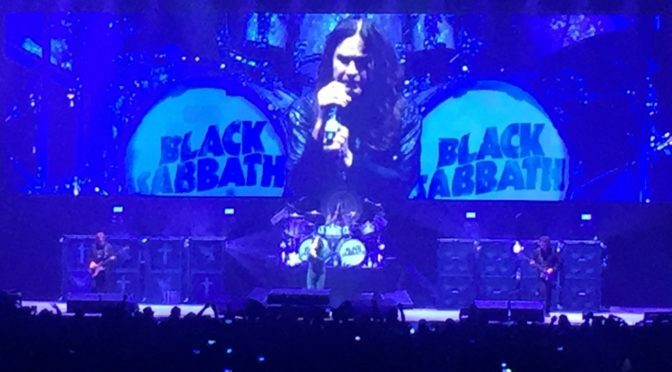 The video footage is from shows in Chile a the week before they came to Brazil. From there they ripped into De Do Do Do, De Da Da Da, a silly song but a big hit on the previous album. Walking on the Moon also sounded excellent as it mellowed out the vibe a bit. Shadows in The Rain is a great tune to follow that up with and The Police did just that. The set ended with Roxanne from their first album Outlandos d’Amour. I’m not a huge fan of Roxanne as it’s been overplayed on radio so much. After a short 10 minute break The Police came back out for a 2 song encore. Man I was stoked because I had heard of encores but this was my first time witnessing one in person! Stewart Copeland again came out jumping up and down like a madman! I think Sting spoke some Portuguese he probably learned while they were there. All I can remember is that I felt awesome after seeing such a great performance and wish I had tickets to see them the next night of the 2 night stand. I went home and taped this ticket stub to my desk, hence the aged old tape marks! I would see The Police again on the Synchronicity Tour a few years later before they broke up. No doubt The Police were at their creative peak during this tour. But with the success came more division in the band especially between Stewart and Sting that would only allow them to produce one more album and final tour before their Reunion tour.